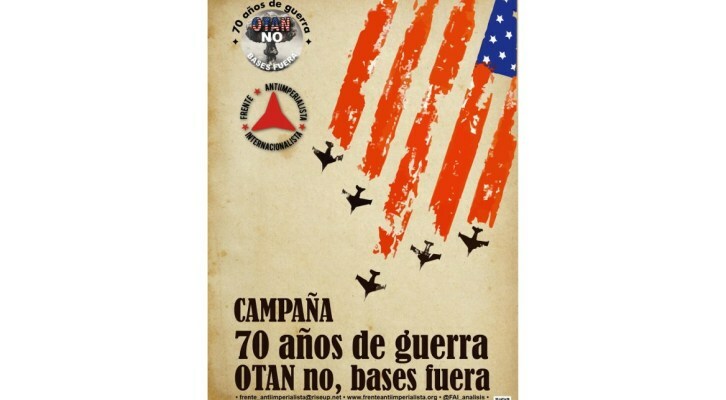 Communiqué of the Internationalist Anti-imperialist Front on the occasion of the 70th anniversary of the creation of NATO. The 4th of April marked the 70th anniversary of the decision of the Euro-Atlantic capitalist powers to found NATO. Its long history of bombings, attacks and war allows us to call it a “criminal organisation”. Successive Spanish governments have always subordinated national sovereignty to US interests. Franco’s dictatorship offered troops to the United States for its war in Korea and with the Pact of Madrid 4 military bases were installed in our territory. The integration into NATO took place after a deceptive campaign full of threats and blackmails to the population. After becoming full members, we have contributed to the dismemberment of the ex-Yugoslavia, participated in the invasion of Afghanistan, in the destruction of Iraq and in the absolute ruin of Libya and we have collaborated with France in the plundering of Africa, operations that have caused countless innocent victims.